The perfect streaming channel for all things strange! 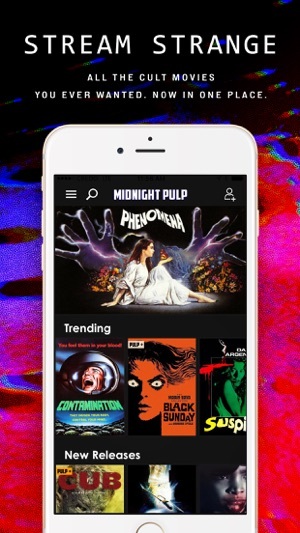 Midnight Pulp offers the best cult movies and shows from all over the world. Watch hard-to-find horror films, digitally remastered kung fu movies, exploitation movies from every decade & much more! 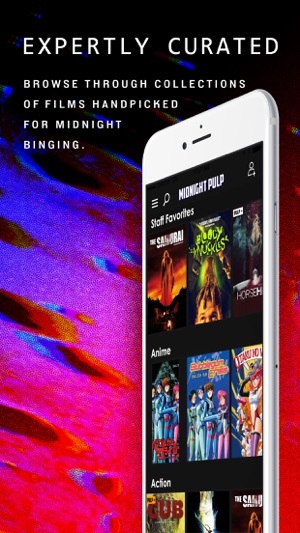 With weekly updates of new content, midnight will never be boring again. 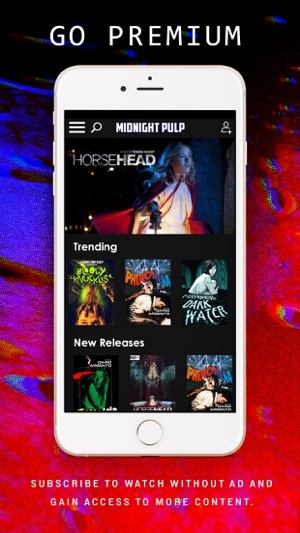 Get more with Midnight Pulp Plus! First, I would recommend you somehow warn folks that there are some things here that might offend (older and kids). I have no problem, that is what pulp is. And of course, you had “Plan 9....” so you had me immediately! “Xoxoxo jay jay jay home” in spring of 2018.
he is passionate about wanting old movies to be available for free, “ especially REALLY OLD ONES from before 2000” ! (my caps )LOL, . Perception of age, so relative, chuckle. Since I’m 70 next month you know this caught my attention and I laughed so hard. Since then, I shared it with probably 20 people who have expressed interest to me about using your app so you should probably send the young man thanks for his marketing. but they’ve all been talked about by others here. They’re not huge issues ,not unexpected for new software. It takes a while to shake out the bugs, i’m a retired software developer so I know of which I speak. Keep the passion, keep having fun. And to borrow from Quentin Tarantino, continue to find and save those pieces of ‘grindhouse’ history for us. So appreciated! The content offered through this app is nothing short of astonishing. Copious grindhouse, '80s cheese, Asian shock, old-school anime, Something Weird-esque, Mondo you-name-it and more. Whoever curates this amazing collection of films deserves a raise. Much more of it is for free than you'd expect, too, and those titles that are locked for non-subscribers are really tempting. You might find yourself reaching for that MasterCard. Put it away, at least for now. 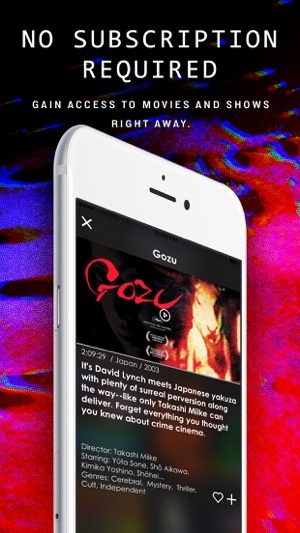 Here's why: This app forced me into a free registration in order to "favorite" titles and create playlists, but then offered no navigation that I could find to then access those lists. Press that little "heart" icon as much as you want, but it doesn't matter. That's not just a minor annoyance. It's a major fail. I'd have been a paid subscriber, these movies are so good. But if this app can't provide me convenient access to them, it ain't worth my five bucks a month. Take it for free, it's worth that. And the quality of the content is worth putting up with what it lacks. But what it lacks means it ain't worth five bucks a month. Cocoro - Learn & Explore!